New RT Series features automatic track tensioning and a pair of Tier III Yanmar diesels. 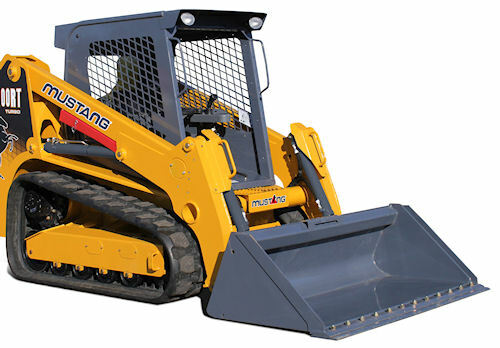 Mustang, a leader in agricultural and construction equipment has unveiled its new RT Series Track Loaders, the 1750RT and the 2100RT. Both machines have HydraTrac Automatic Track Tensioning, which eliminates the need for manually setting track tension. It also eliminates retensioning, because it maintains the proper pressure throughout the life of the track. The basic difference of the two machines is under the hood, with the 1750RT powered with a naturally-aspirated Tier III Yanmar diesel rated at 179 ft. lbs. of torque, and the 2100RT moved along with a turbocharged version of the engine that is rated at 206 ft. lbs. Both are equipped with anti-stall technology to end restarts on heavy loads. * Optimized radial lift booms for enhanced strength and optimal forward reach at trailer loading and dumping heights. Maximum lift for both models is 127.5 inches. * Cab features designed for ultimate ergonomic comfort and efficiency such as an adjustable seat-mounted electrohydraulic control that moves with the operator for precise controllability and reduced operator fatigue. * The standard "5X5" Drive Control system that offers five settings that change five parameters to suit operator preference for a wide variety of job needs. * Welded, dedicated track system for smoother ride and traction. * Tilt-out foot pod for easy foot well cleanout and access to the fuel tank and other under-cab components. More information on the new Mustang models is available at www.mustangmfg.com/maketracks.aspx.